I made this costume with an old black dress. My friends and I wanted to dress as a group and have a theme. We chose Disney. I went to Michael's Craft Store and purchased material to add to the top of the dress to make the "skin" of Ursula and then material for the tenticals. Once I made a pattern of one tentical, it was a breeze to make the others. It was basically cutting out a large triangle and I added newspaper and wire on the inside so that they would curl up a bit. It took about 6 full hours of work to complete the costume but the end result was satisfying! 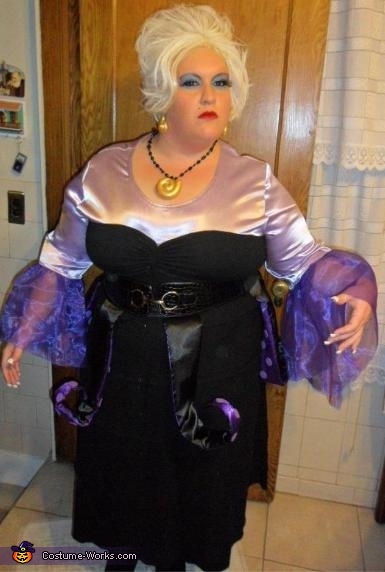 I also mirrored Ursula's make-up and purchased a white wig and styled it myself.